Ocean City Sells Out At Forbidden Planet Launch Event! 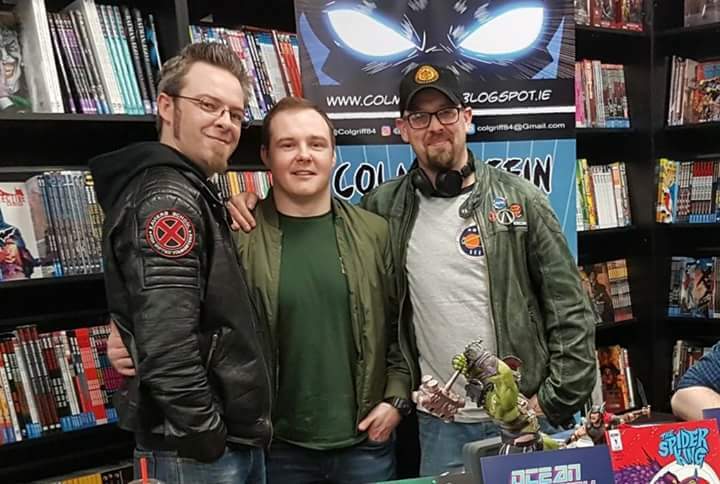 Yesterday was unreal and we want to say a huge thank you to everyone who came out to Forbidden Planet Dublin in support of Rogue Comics as we launched #OceanCity by Colm Griffin and Alice Coleman. We are delighted to say that thanks to your support our first launch event was a great success and the book SOLD OUT its entire first print run on launch night! It was fantastic to see that the event was a huge success for IDW Artist Simone D'Armini as his brand new book #TheSpiderKing was also sold out by the end of the night. Congratulations to Simone who dutifully spent the event signing and doing amazing sketches for everyone in attendance and thanks for letting us co-launch a book with him. As the editor for #OceanCity I want to take this opportunity to say a huge congratulations to Colm & Alice for putting out a book Rogue Comics is proud to call one of our own. I also owe a huge thanks to the man behind the event Mr. Scott Adair of Forbidden Planet Dublin without whom there would not have been a launch. Finally I want to give a quick update for people trying to buy #OceanCity from our online store. We have filled all current orders, however we are now completely sold out of the first print run. Bear with us as we're rushing the book back to print to fill the demand and as soon as it's available we will post about it on all of our social media. For now, thanks for #GoingRogue.